It’s been a busy week of editing, more editing and then trying not to cry at all the badly used capitals this week. It’s mostly Annabel doing the crying as she hunches over mistakes that she’s surely seen before. So today, an entirely light hearted tale of the toilet who cried and a note I found in a book from a charity shop. 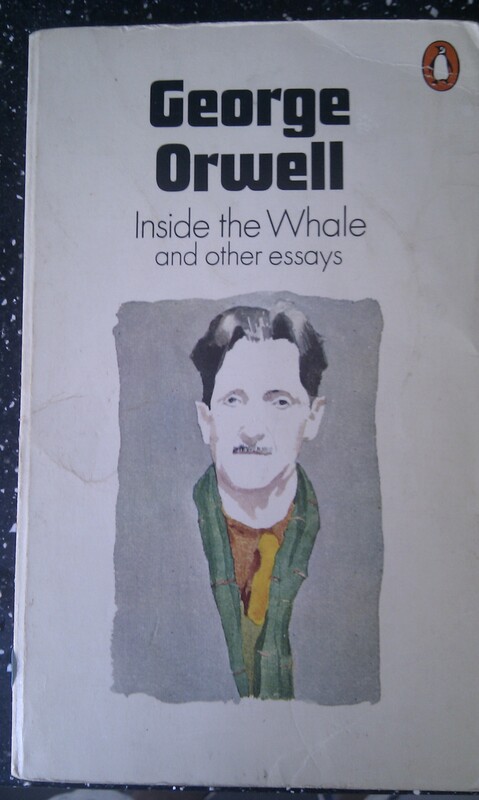 I had been searching for a copy of George Orwell’s essays for some time, so when I stumbled upon it in a charity shop it was with great delight that I ran to the counter with glee and dignity to purchase it for my own. Imagine then when that delight faded to horror at the revelations inside. Not the fine words of Orwell, discussing matters as far ranging as the nature of Englishness to the importance of variation in magazines for young boys. No my terror was more direct, more recent, more shockingly coloured. On a bright pink post-it note, tucked like a garish booby-trap against happiness on page 108, I found details of the cracked cistern. Suddenly all the joy at discovering my treasure amidst the shelves had turned to dust in my worry for the cistern. Had the person who penned this vital note passed away or simply passed on this book? Did this note find the fixer it desired? Clearly the words themselves conveyed a kind of impetus to their distress, the use of a plus sign instead of and, an indication surely of the limited time available. Perhaps they needed to dash off back upstairs to check the defences of the bucket held? Is that where the possible accident took place? Was it there, having carefully tucked the note inside a book, that word of mouth came to an abrupt end. What if somewhere in Edinburgh there was a cistern, leaking quietly for all time. A bucket stood at guard, always on duty. A trickle of dirty toilet water seeping over the edge that was slowly eroding the bedrock of our fine city. What if this note spelled The End? And despite Orwell’s discussion on p108 of King Lear, Tolstoy and other stories, my immediate concern was shifted to the fate of this ruptured cistern that wept alone in an unknown upstairs. That pink note, wedged haphazardly between the pages, raised so many questions. It raised worry too. And I thought to myself if I could just write like that. If I could get the words together to make people cry about a cistern then I’d have done my job. It’s a shame whoever put that note in that book got there before me. Now if only I could find a story as powerful as the toilet that won’t stop crying. There’s a message there I think. 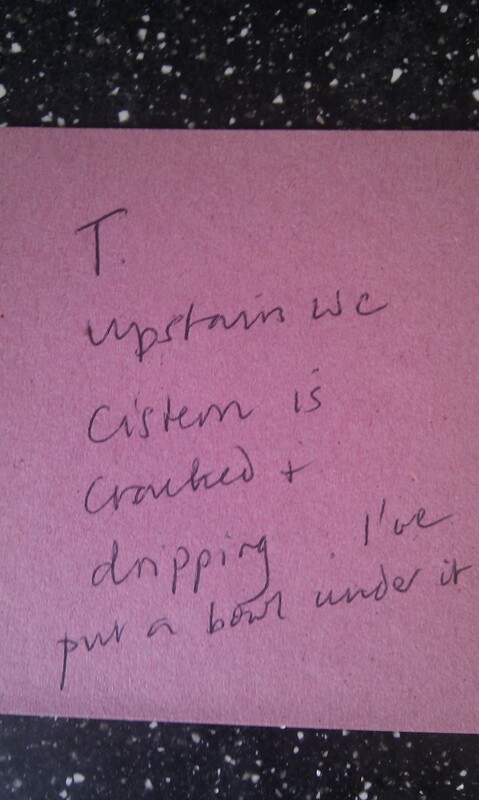 Be careful what you write down, it may end up in a book given to a charity shop. Beware too of leaky cisterns. I hope the cistern was fixed, that the need for the note has expired and our city is safe from the erosion of words gone astray. It’s good to know though, that if you just get those words in the right order, they make can make people think. Even if only about toilets. Life’s not all it’s cracked up to be; it can be a never ending stream of disappointment!